Alaska Air Group, Inc. (Alaska Airlines and Horizon Air) (Seattle/Tacoma) today reported fourth quarter 2012 GAAP net income of $44 million, or $0.61 per diluted share, compared to GAAP net income of $64 million, or $0.88 per diluted share in 2011. Excluding mark-to-market fuel hedge losses of $10 million ($6 million after tax, or $0.09 per diluted share), the company reported record fourth quarter 2012 net income of $50 million, or $0.70 per diluted share, compared to net income excluding mark-to-market fuel hedge gains of $37 million, or $0.51 per diluted share, in 2011. The company reported full-year 2012 GAAP net income of $316 million, compared to $245 million in the prior year. Excluding the impact of the items noted in the table below, the company reported record net income of $339 million, or $4.73 per diluted share for 2012, compared to net income of $287 million, or $3.92 per diluted share in 2011. This marks the company’s ninth consecutive year of adjusted profits and the third year in a row the company has exceeded its goal of a 10 percent return on invested capital. Copyright Photo: Michael B. Ing. Newly-painted Boeing 737-890 N559AS (msn 35178) displays the updated Wild Alaska Seafood “Salmon-Thirty-Salmon 2” as it climbs at Los Angeles International Airport. This entry was posted in Alaska Airlines, Alaska Horizon, Horizon Air and tagged 35178, 737, 737800, 737890, Alaska Airlines, Alaska Horizon, aviation, Boeing, Boeing 737, Boeing 737800, Horizon Air, LAX, Los Angeles, N559AS, SalmonThirtySalmon II, transportation, Wild Alaska Seafood on January 24, 2013 by Bruce Drum. Alaska Airlines today (October 12) launched nonstop service between Orlando, Florida., and San Diego (San Diego-Orlando service started last night). The carrier will fly between the two cities five times a week. The flights will be operated on Boeing 737-800 aircraft, accommodating 16 passengers in first class and 141 in the main cabin. Copyright Photo: Brandon Farris. Boeing 737-890 N559AS (msn 35178) in the new Wild Alaska Seafood scheme arrives at the Seattle/Tacoma hub. This entry was posted in Alaska Airlines and tagged 35178, 737, 737800, 737890, Alaska Airlines, aviation, Boeing, Boeing 737, boeing 737 800 aircraft, Boeing 737-800, Boeing 737800, N559AS, SalmonThirtySalmon II, SEA, Seattle/Tacoma, transportation, Wild Alaska Seafood on October 12, 2012 by Bruce Drum. Weighing in at 91,000 pounds, the world’s largest salmon landed in Anchorage on October 4 to a cheering crowd of hundreds of Alaska Airlines employees and seafood industry executives. 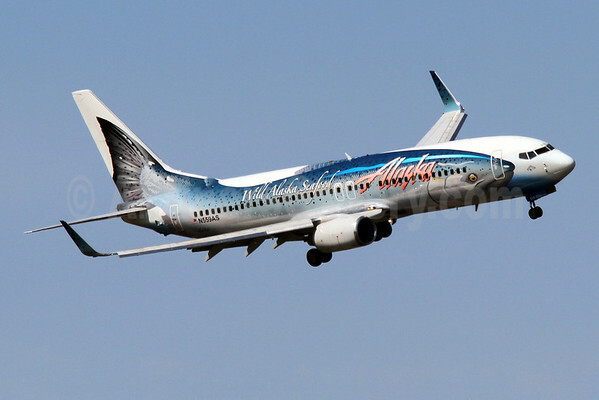 Stretching nearly 129 feet, the fish-themed Boeing 737-800 is the most intricately painted commercial aircraft in the world and celebrates the partnership of Alaska Airlines and the Alaska Seafood Marketing Institute. The new “Salmon-Thirty-Salmon II” design is nearly identical to an earlier version of the paint scheme that Alaska Airlines unveiled on a 737-400 (737-490 N792AS msn 28887) (see link below) in 2005, which was re-painted with the carrier’s traditional Eskimo livery last year. In addition to sporting the glimmering image of a wild Alaska king salmon like the original “Salmon-Thirty-Salmon,” the new design is about nine feet longer and also features fish scales on the winglets and a salmon pink-colored Alaska script across the fuselage. The design was produced in partnership with ASMI, which promotes wild, natural and sustainable Alaska seafood. Alaska Airlines flew nearly 24 million pounds of seafood last year from Alaska to markets in the United States, Canada and Mexico. Streamlined flight schedules and a rigorous training program required of all airline employees who handle perishables ensures the seafood that travels from Alaska waters to markets across the United States arrives fresh—often within 24 hours. 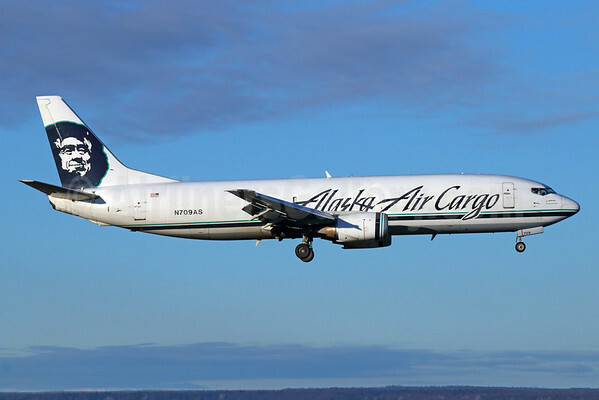 The goal is to keep seafood moving rapidly throughout its journey on Alaska Airlines and maintain a consistent temperature range from the time it leaves the water to when it arrives in stores and restaurants. 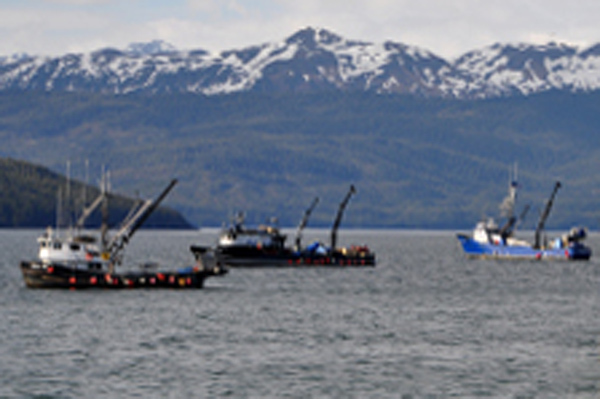 About half of the United States’ total seafood catch comes from Alaska fisheries, according to ASMI. 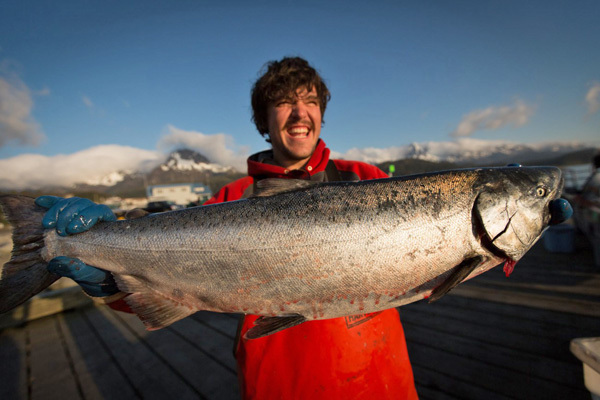 In addition, the state of Alaska is widely regarded as a world leader in sustainable management of its seafood resources. The 129-foot-long Boeing 737-800 has a wingspan of 117 feet and a cruising speed of 530 mph. Four gallons of Mylar paint was used to create an iridescent sparkle over the nearly 3,500 fish scales, which also makes the painting three dimensional. 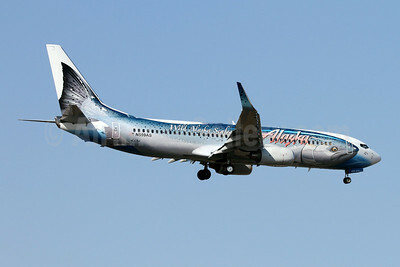 More than 90 percent of the fuselage was airbrushed with 21 unique colors to create the lifelike king salmon. A crew of eight worked around the clock for 27 days at Associated Painters Inc. in Oklahoma City to paint the plane. The plane accommodates 157 passengers and six crew members. 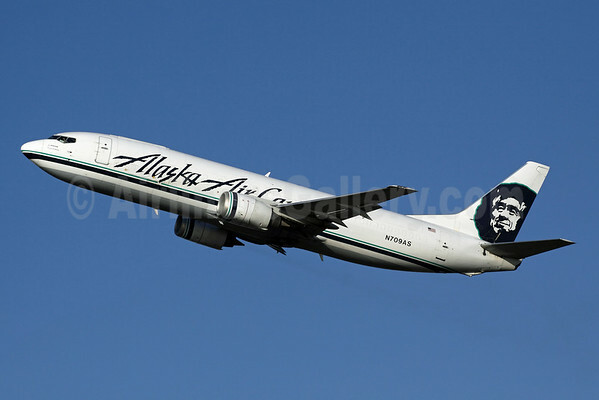 Beginning today (October 5), the aircraft will fly passenger routes throughout Alaska Airlines’ network, connecting destinations from Hawaii to Boston and from Anchorage as far south as Mexico. 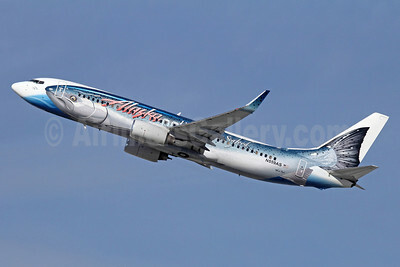 The “Salmon-Thirty-Salmon II” aircraft is an original design of Mark Boyle, a Seattle-based wildlife artist who is also a recognized leader in the livery design of commercial aircraft. 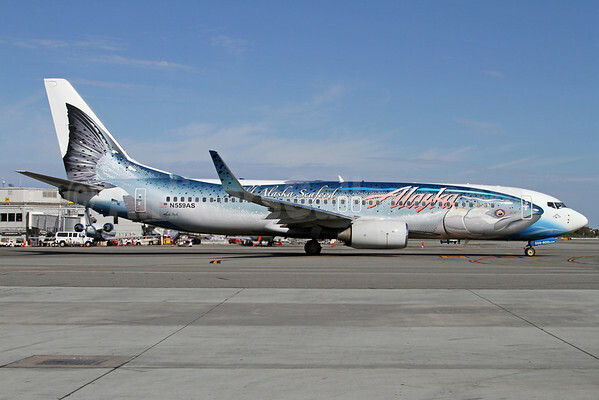 Boyle designed the first Salmon-Thirty-Salmon plane and has created a dozen other special paint themes for Alaska Airlines in recent years, including the Spirit of Disneyland I and II and the Spirit of Make-A-Wish planes. This entry was posted in Alaska Airlines and tagged 35178, 737, 737-800, 737-890, Alaska Airlines, alaska king salmon, alaska seafood marketing, alaska seafood marketing institute, aviation, Boeing, Boeing 737, Boeing 737-800, N559AS, Salmon-Thirty-Salmon, transportation, travel, Wild Alaska Seafood on October 5, 2012 by Bruce Drum.